This poster was designed by Daniel Wiesmann (Berlin, Germany) for the German band Playstation (Foster, New Masters of Poster Design, p.231). This band poster is an example of how the figure-ground relationship can be reversible, and therefore extremely dynamic. 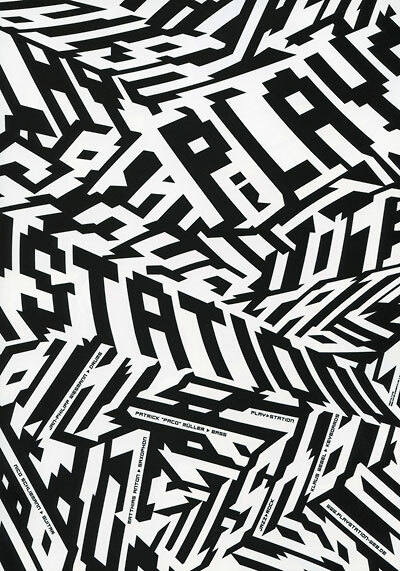 In some parts of the composition, the white areas read as ground, background, or negative space and the black areas read as legible letterforms (figures, positive space, forms), such as the part of the poster where it is fairly easy to read the words “PLAY” (top right) and “STATION” (middle left). In other parts of the composition, however, the positive forms seem to be white letterforms on a black background, such as at the bottom right corner of the poster, where there appears to be an upside-down “LAYSTA…” This figure-ground reversal draws attention to the fact that negative space need not be passive. The very active figure-ground relationship exists in part because the black and white elements in the design take up equal amounts of space and are very evenly spaced. Also, the cropping or framing of the composition is very tight, with the forms/words running off the edges of the poster on all sides (it is printed full-bleed). The active figure-ground relationship on this poster makes legibility difficult, but the legible words “PLAY” and “STATION” combined with the dynamic composition serve to draw the viewer in to the read the fine print in the lower half of the poster (small lines of black text within the white letters which show the names of band members and the instruments they play). This entry was posted in 336 Blog, Sample Posts by Your Professor and tagged cropping, figure-ground, form-counterform, Framing, full-bleed, postive-negative. Bookmark the permalink.